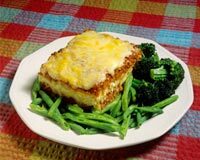 Bean Lasagna is a very popular recipe. Learn how to make/prepare Bean Lasagna by following this easy recipe. In a bowl mix beans stewed tomatoes and a couple of tablespoons of taco sauce. Pour about a quarter of the taco sauce in the Lasagne pan. Then cover it with noodles. Layer the beans, drained tomatoes, sauce, corn, cheese and noodles and stir. Now cover tightly with foil. And bake for about an hour, until the noodles turns tender. Make it sure to check after 5-10. Remove the foil and sprinkle with olives and bake for another couple of minutes. Serve hot.